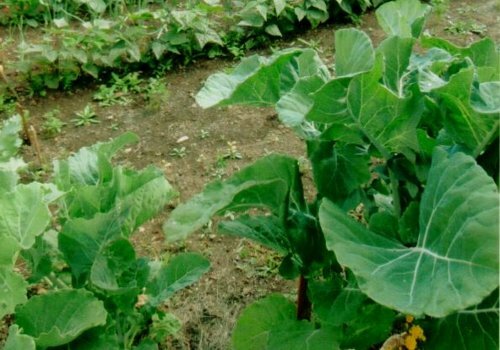 (Spanish kale; Thousand leaf cabbage) This is a giant kale that came to the Americas from Spain centuries ago, presumably with early settlers. It became a family heirloom that is still passed on from generation to generation. It can get up to 5ft (1.5m) tall, and even taller when it flowers. SeedZoo contributor, Lorraine Collett, says that the leaves get so big they look like an elephants ear. Imagine leaves that get up to 20in/50cm long and 12in/30cm wide! The leaves can be used in soups, stews, stir-fries and can be used like cabbage leaves to make meat rolls. Hummingbirds love to visit the yellow flowers. If the flowers are allowed to set seeds, the plant will reseed itself where winters are mild. Easy to grow. Happily grows as a spring-planted annual where winters are more severe.